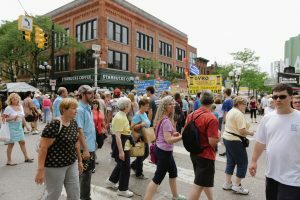 Hundreds of artists and visitors will be heading to Ann Arbor this week to take part in the Ann Arbor Art Fair. 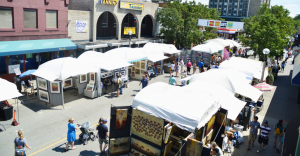 From July 20-23, the Ann Arbor Art Fair hosts several different fairs, all located in or near downtown Ann Arbor. There will be a variety of artists showing off and selling their art all weekend long. You can find everything from highly contemporary works to very traditional crafts including glass, painting, ceramics, photography, jewelry, fiber, wood and more! There will also be several food courts set up throughout the street fair serving delicious food and drinks. Trinity will be providing a shuttle to the art fair from Huron High School. We will offer two different drop off points: Fletcher and Washington and South University at Forest. Parking is free at Huron High school and the round-trip ticket cost is $3 for adults and is free for children under five. Our shuttle will be available on Thursday through Saturday from 9 a.m. to 10 p.m. and from 11 a.m. to 7 p.m. on Sunday. Trinity will also be providing a shuttle leaving from Pioneer High school on Sunday only from 11:00 a.m. to 7:00 p.m. with $3 round trips and free rides for children under five.